Original IP’s from Square Enix are becoming somewhat of a rarity these days. What’s even more scarce is to see anything published by them that’s not an RPG. I can’t even remember the last game I played with their logo on it that wasn’t a Final Fantasy spinoff. The only one that comes to mind is The Last Remnant, and that was released in 2008. Hot on the heels of the recently released 0 Day Attack on Earth comes another twin stick shooter titled Death by Cube. Is this downloadable Xbox Live Arcade game as fun as its name, or does it spell Death by Boredom? Square Enix is typically synonymous with deep storylines told via gorgeous cutscenes and CG sequences. If you walk into this title expecting more of this, you’ll be sorely disappointed. There is a story to this game, but I couldn’t really grasp what it was. Something about robots and their inner monologues. It isn’t too important anyway, as it’s just an excuse to shoot things and scatter their blood… er, “red oil”Â all over the place. 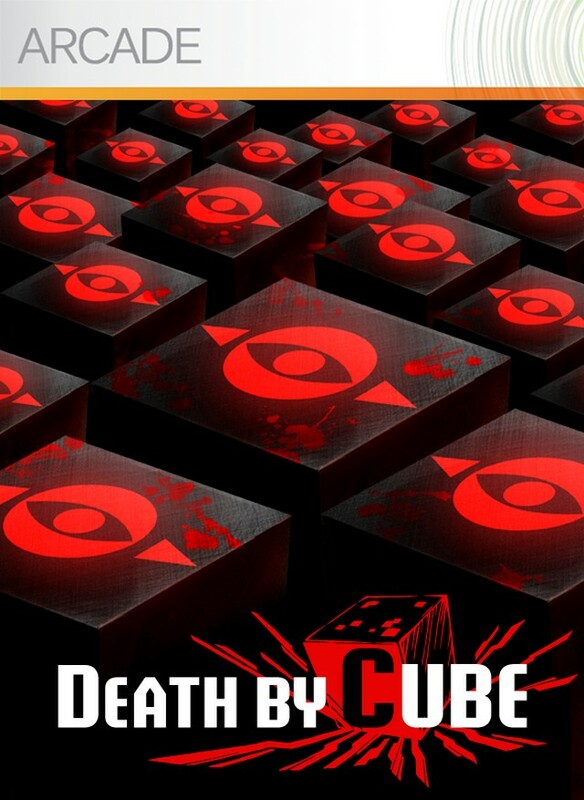 Death by Cube‘s single player starts you out with just enough in game currency to unlock the first level of the first robot’s story. Depending on your performance, you will earn medals of either gold, silver, and bronze that will net you more currency to unlock more levels and progress through the game. Each story contains levels that range in theme from destroy all enemies to defending a base. Regardless of which one you play, they do share one thing in common: complete and utter chaos. 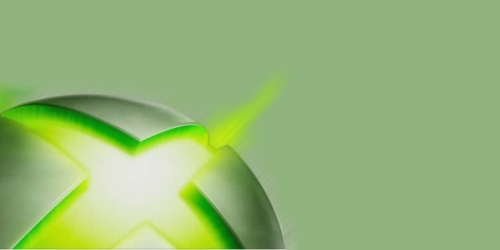 If you want to take a break from the single player game, there are a few multiplayer modes that you have access to over Xbox Live. Unfortunately, I can’t comment too much on these modes as there were never enough players online at a given time in order to form a game. If you think that you will have better luck and want to give it a try, you can choose between standard deathmatch and base defense modes. 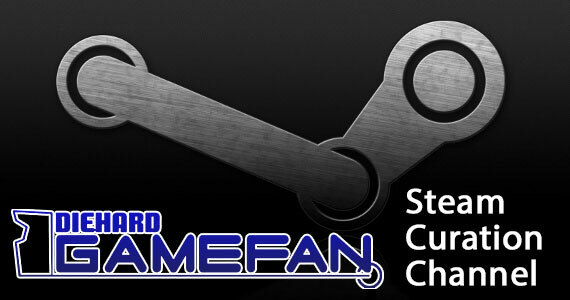 There is no couch multiplayer, so if you can’t find a game, then you’re out of luck. The first time you play Death by Cube you might think that you are colorblind seeing as how everything is rendered in some form of grayscale. The backgrounds that you do battle on, the robots, and even the enemies are incredibly bland in terms of color, until you shoot something for the first time. Then the screen explodes with red. For the longest time I couldn’t understand why these robot cubes were bleeding all over the ground and camera, but according to the manual, it’s supposedly red oil. Why this oil couldn’t have been blue or green or even black is beyond me, though the game stopped making sense the first time a “cutscene”Â started, so I let it slide. The background music consists of a couple techno tracks that loop repeatedly on the game’s many stages. There’s also a tune that plays during the menu, but it’s far more serene that the other songs on the soundtrack. At first they all seem rather fitting, playing on the futuristic theme of the game. After playing the same stage several times due to the intense difficulty (which I’ll get to shortly), it gets to be a little grating. While there isn’t really voice acting in the sense that it’s being used to tell a story or convey character emotion, there are some robotic voice clips strewn about the game. They tell you when the mission is about to start or when it has finished, or when you’ve achieved some sort of bonus in the game. But again, these get rather old after you’ve heard them so many times. 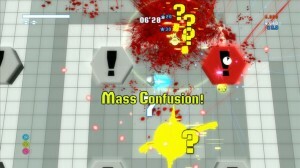 Death by Cube is a twin stick shooter, attempting to continue the legacy started by such games as Geometry Wars or Super Stardust HD. You use the left thumbstick to control your movement, and the right stick is used to aim your shots at your enemies. Other moves in your arsenal include the ability to perform a dash move that dazes your opponents, as well as a shield that can absorb their bullets and fire them back. 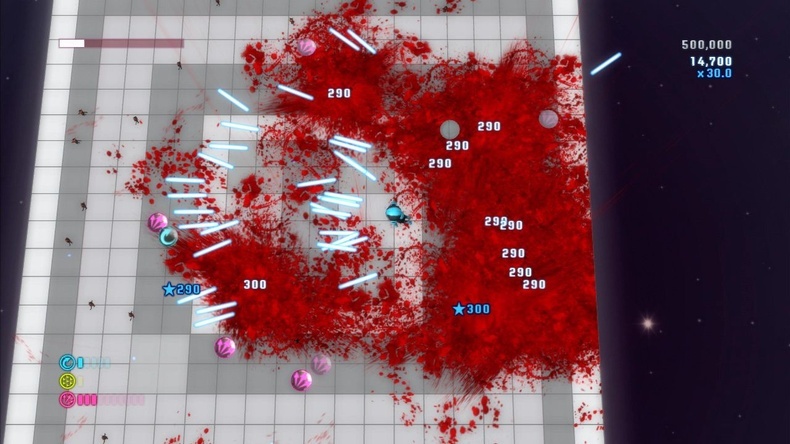 Stringing enough kills together will net you some temporary powerups that will strengthen the damage you do by your various abilities, but once you die you will lose them all. During the course of the game, you will be assaulted by waves of walking rectangles on legs as well as an odd assortment of other robots that do everything from firing bullets to simply ramming into you. And they come in vast numbers. 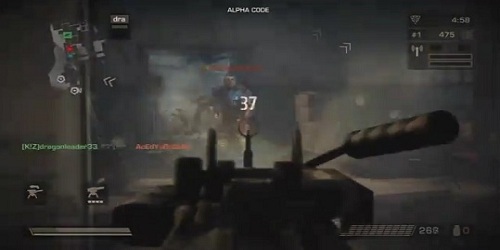 So much so that it’s difficult to even keep track of what’s happening in the game because if there isn’t bullets covering the screen, it’s blood that will sometimes obstruct your view. 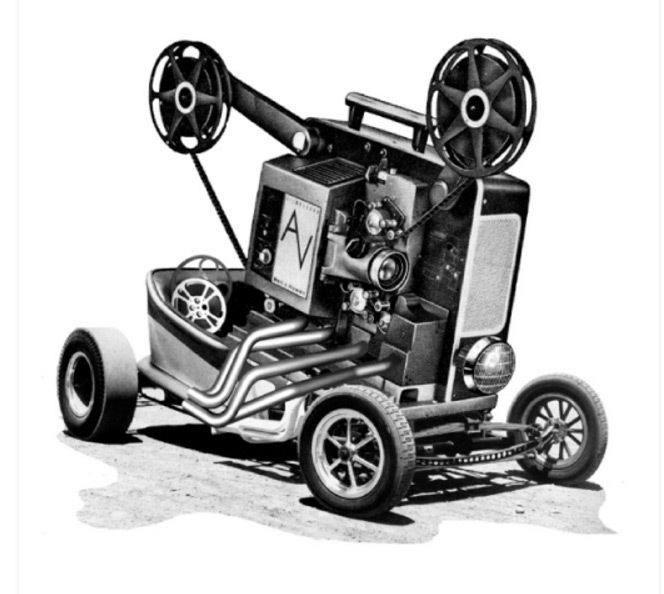 It gets to a point where there is so much happening onscreen that the frame rate takes a noticeable plummet. 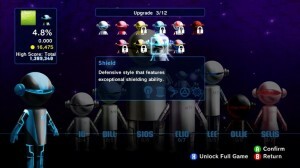 On the level select screen, you have the option to purchase upgrades for your robots. Some of these are aimed at increasing defense, and others may be used to improve shield and dashing abilities. The problem with this upgrade system is that you can’t stack any of the abilities. You can choose to exceed at one thing or another, but never both. And since the upgrades offer only minor improvements, it doesn’t feel worthwhile to grind enough cash in order to buy them. Sadly, there isn’t much more to it than that. Saying that’s it’s derivative of the titles I mentioned above is being too generous. I love it that Square Enix is branching out by publishing other genres, but this is not a step in the right direction. It’s a twin stick shooter at heart, but lacks the balance and polish of some of the other games on the market. I couldn’t say if there’s much to do after the completion of the single player, as the challenge proved too great to reach its conclusion. One might say that the replayability exists in the fact that you will be replaying the same levels over and over to earn the upgrades I mentioned earlier or to purchase new stages in order to progress. There is always the multiplayer component, but since it’s so difficult to find games even while this title is new, I don’t see this being feasible in the long term. Simply put, this game is hard. Perhaps it was just my playing ability (or lack thereof), but I honestly felt that my success in completing a stage was based more on dumb luck than my skill level. I performed far better by dashing around and shooting at random than I did actually trying to form some basis of a strategy. I can barely scrape together a bronze medal in most cases much less a gold. 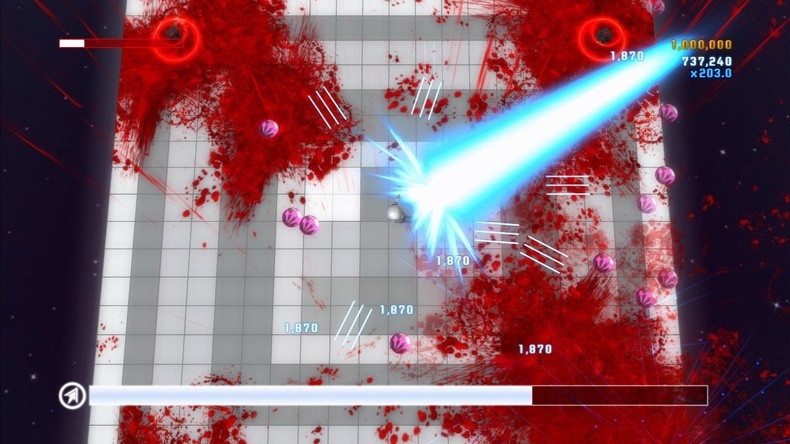 Let’s put it this way: this game is perfect for your inner masochist. Death by Cube‘s faults would be more easily forgivable if it were innovative or at the very least brought something new to the genre. Instead, this title does neither. It derives its ideas from an already crowded pool of titles that can be found on both Playstation Network and Xbox Live Arcade, but does so while forgetting to integrate any of the fun. 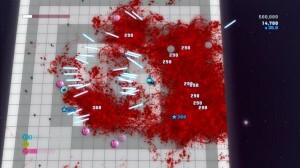 The only thing that’s original here is the insane levels of red splatter that gets thrown everywhere. Normally, I’m a huge advocate of Square Enix and the products they publish, but to recommend this game to even the most die hard fans would be doing them a disservice. Death by Cube had all the potential to be as good and enjoyable as the Robotech games as well as every other twin stick shooter on the market, but it just wasn’t there. You can always try out the demo version if you’re unsure, as the gameplay doesn’t change drastically from one level to another. This is the second game of its kind published by Square Enix, the first one being 0 Day Attack on Earth. While I never played the full version of that title, the demo was none too impressive. I would still probably put it above this game, though I don’t think I would fork over 800 Microsoft points for either of them. Death by Cube hopes to capitalize on the success of other twin stick shooters such as Geometry Wars by introducing a robot protagonist, killer cubes that bleed, and a multiplayer mode. Unfortunately, this title fails to be even a good copy of the games it tries to mimic and instead is nothing more than a mess of tedious gameplay, unbalanced stages, and a bland presentation. I’m a huge Square Enix fan, but I think they need to step away from this genre and go back to innovating JRPG’s.